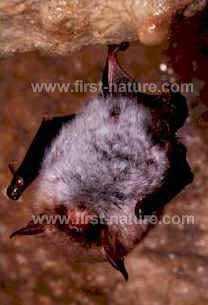 Natterer's Bat is a fairly common species in the British isles. It is of medium size, reaching 4 to 5cm head-and-body length and weighing 6.5gm to 12gm. Rather long ears and a long, pink face are helpful identification features. You will see these bats taking insects as they fly beside deciduous woodland or along hedgerows. Natterer's bats often fly very low, and they can sometimes be seen taking spiders and insects from vegetation. When over water, Natterer's bats are reported usually to fly higher than Daubenton's Bats. Old building and gaps in stone walls are used by these bats as summer roosting places. They make use of gaps in old timber roofs as well as hollow trees, and maternity colonies can comprise between 30 and 200 individual bats. In winter, Natterer's Bats usually roost in cold underground sites. They stay there during the cold months of December, January and February.